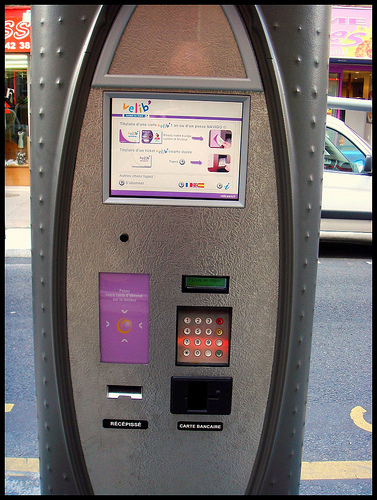 The following assumes you are a tourist in Paris and not a resident with a Metro pass. If this is you then read on. The Velib’ system is one of hundreds of bike-rental schemes popping up all over Europe these days. The Paris version is surprisingly good. There are stations, where you can pick up / drop off freely, all over the city and you are never more than 300 meters away from one. 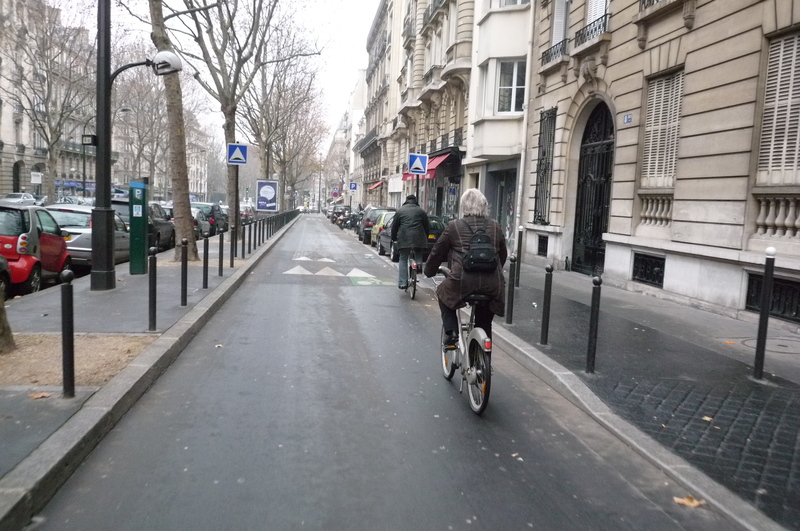 Paris, at least in the core where I was, also has lots of bike lanes, including fast-moving bus lanes and low-traffic side streets. It’s a really great way to see the sights of the city as well, since it’s mostly flat and you get the benefit of seeing what is in between, i.e. the rest of Paris. A really fun way to get a feel for the city. And to get around this wonderful city you’ll need a map. 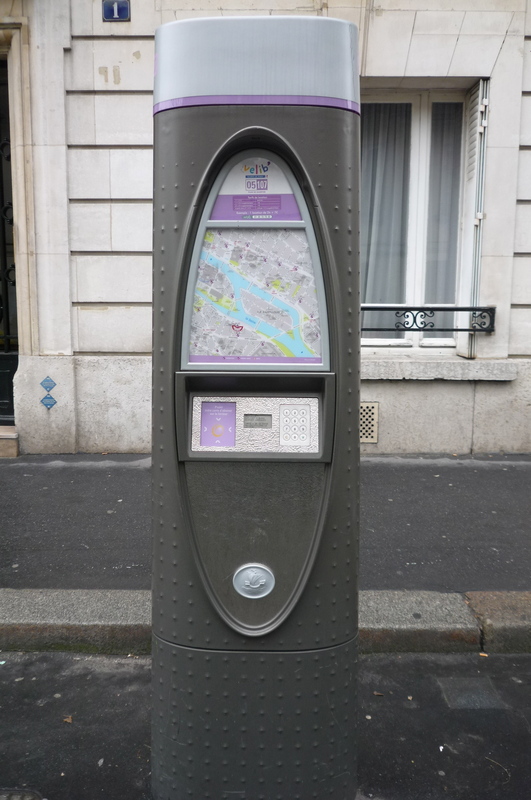 Paris Utile is notepad sized and has maps of all the arrondissements with ALL the Velib’ stations in the city. Indispensable. So, how do you use this thing? Well, first you find one of these. These are at every Velib’ station. Here’s the other side, which you’ll need first. The screen at top has clear instructions in French, English and Spanish so I won’t bore you with the details, but here are some essentials. You need to have a credit / debit card that the system recognizes. Their site says they accept most major credit cards, but it’s not clear if they need to have a smart chip (all European cards do). Once you pay your deposit (for security) and choose your subscription (1 day min) you will get a ticket with a code. With this you can choose the bike of your choice (by inputting its number) and ride away. The red light on the attachment point will turn green and you just roll the bike out backwards. The first 30 minutes are free, which means that you could theoretically ride these bikes for your whole trip and pay a ridiculously low price (subscription for a week is €5). Once you go over 30 minutes you start paying, as I found out the hard way. I think the max you would pay for a whole day is €7. When you’re done, find a station and just drop off the bike. Bonne Route! 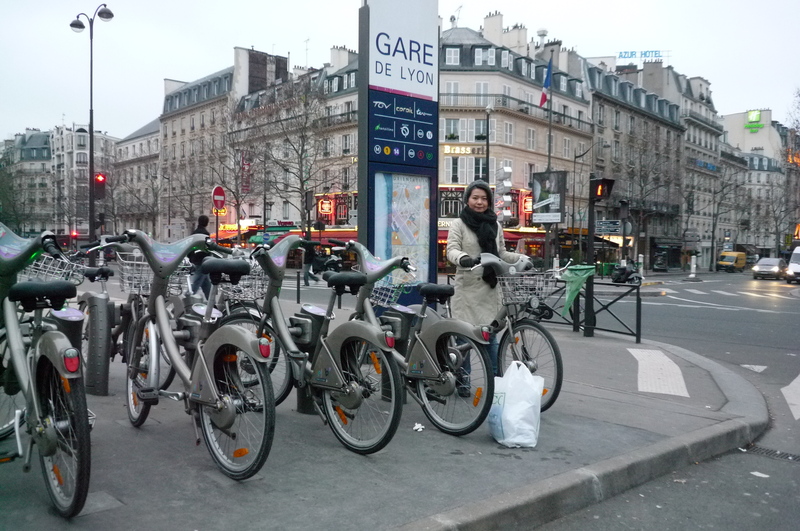 Click here for a ride I did through Paris using the Velib’ system. 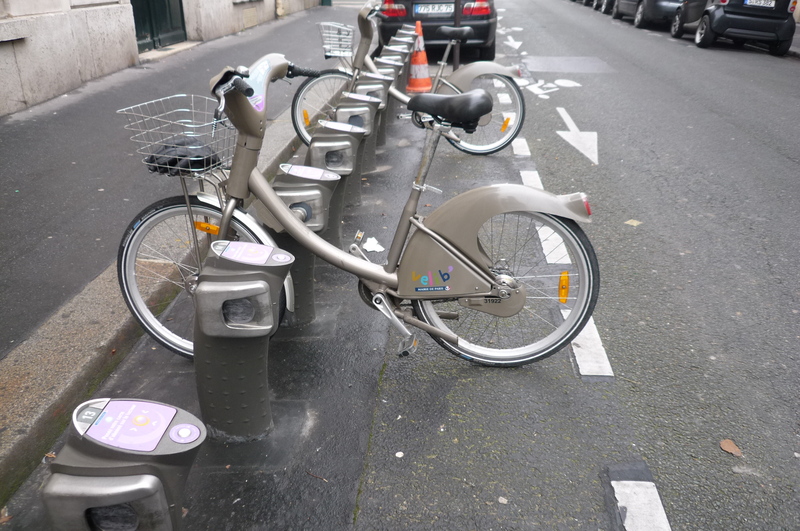 This entry was posted in Cycling, Transport and tagged paris bike hire, paris bike rental system, velib. Bookmark the permalink. 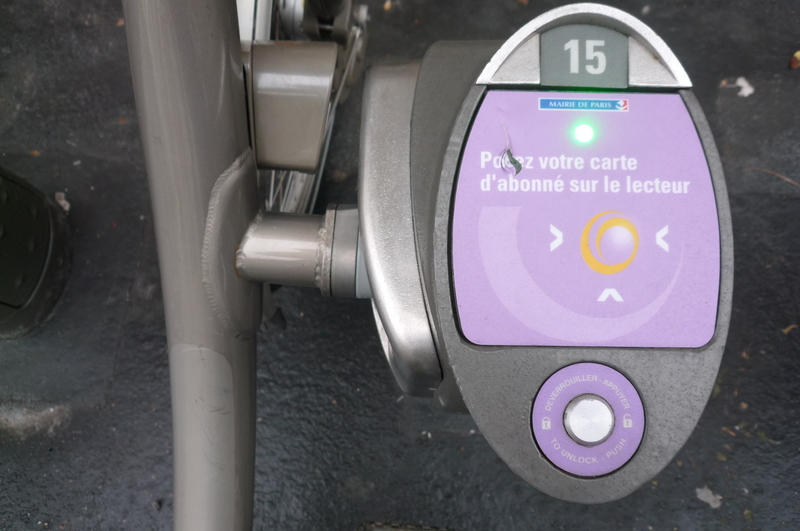 Velib is awesome, but you’ll need a credit card with an embedded chip. no luck otherwise. Note: time your ride allowing for the possibility of your destination’s velib station to be full. If so get info from the station’s automatic terminal regarding the nearest slots/station available and also get a 15 mn free ride grace period on top of your original 30 mn. I did get a debit card with a chip in it, which has come in handy in other situations. But Velib machines do accept my Amex Blue (has a chip, if not the same format as the european ones). Thanks for posting the info on the map w station listings: essential! hey..the free ride is for the first half hour…..is it first half hour of THE DAY or half hour of each ride? if it is free for the first half hour of each ride, theoretically we can ride for free the whole 24 hours (if we return the bike for every 30 minute and then re-ride a new bike)….am i right or wrong?? I think you’re right, Zuhri. It’s free for the 1st half hour EACH TIME you rent a bike. I pretty sure that was one of the points of the system, i.e. making it cheap to commute, go shopping, etc. Check it out and let me know!